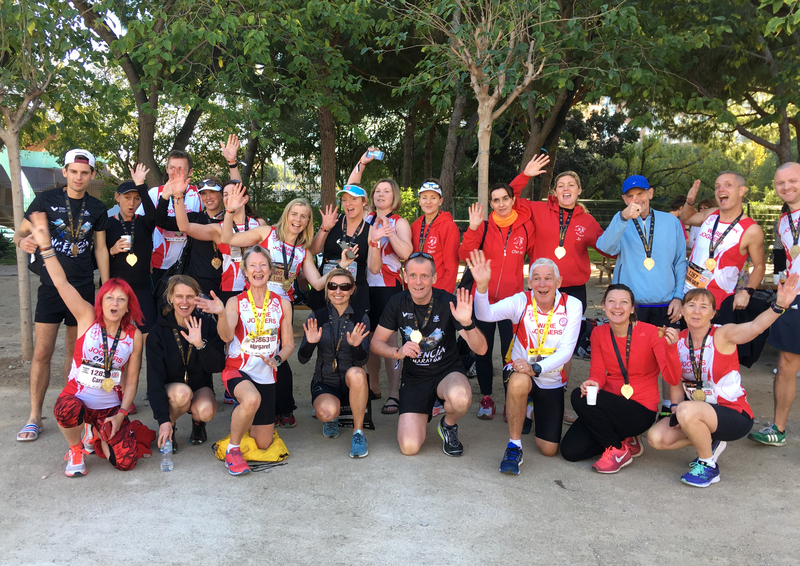 30 Ware Joggers, accompanied by family and friends, chose a weekend away from the cold and rain of the UK to take part in the Valencia marathon and 10K races. The day dawned with late Autumn Spanish sunshine providing great conditions for running and the setting of the beautiful City of Arts and Sciences made the event even more perfect. The 22,000 runners began by crossing the Pont de Montiolevet and ran down towards the marina, on through the pancake flat streets of Valencia passing the passionate cheering crowds and numerous groups of Latino drummers. The latter stages of the race took runners alongside sections of the Turia river bed, around the old town centre passing by the Palace of the Marquis of Dos Aguas and back towards the City of Arts and Sciences. As runners approach the finish line they run down the blue path in the centre of the pools which sit alongside the Musée des Sciences. The enthusiasm and encouragement, from the huge number of spectators who line the route at this point, is second to none and the emotions experienced by many runners is intense. A number of Ware Joggers mentioned crossing the finish line with tears in their eyes. Ware Joggers marathoners produced some amazing results with Michael Waddington breaking a club record in a time of 2:40:19. Jon Williams and Mark Cyl also finished in under 3hrs with times of 2:54:30 and 2:59:25 respectively. All club members finished the race, many with new personal best times; Garth Morris 3:24:19, Kerri Spavin 3:37:57, Jack Whitelegg 3:37:57, Lisa Roberts 3:44:00, Kenny Blythe 3:49:18, Beverley Mclees 3:51:12, Anthea Francis 3:55;06, Lorraine Oakley 3:56:20, Ewa Merlo 3:59:49, Paul Brennan 4:00:44, Sam Rowe 4:14:15, Joanne Gladding 4:23:30, Barry O’Connor 4:19:27, Michelle Cross 4:29:17, Annalisa Williams 4:32:35, Carol Hayward 4:49:36, Christel Ainge 4:51:24, Marsha Jenkins 4:54:28 and Clare Watson 5:36:44. 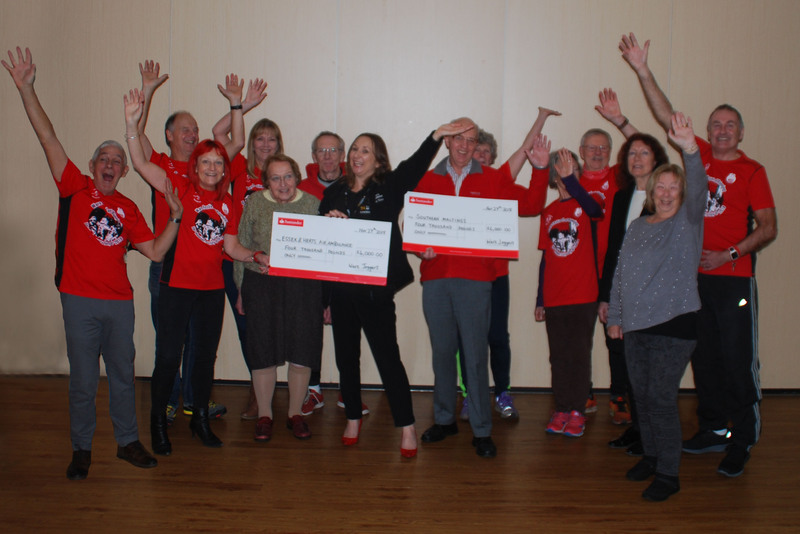 Following the success of the Ware Festival of Running in July, which saw more than 650 runners take on the 10 mile and 10K courses, Ware Joggers were able to present large cheques to their two charities, Essex and Herts Air Ambulance and Southern Maltings. The record fundraising was very much due to the support of key sponsors Blue Square, Network Homes and Peter David Homes. Ware Joggers Chairman, Robert Waddingham, together with some members of the organising team were able to present cheques for £4,000 to each of the charities. The Ware Joggers long time charity partner, Essex and Herts Air Ambulance, receives no government funding and relies on charity donations to provides pre-hospital emergency services to the people of Essex, Hertfordshire and surrounding areas. Each life-saving mission costs just over £2,700 and with an average of six each day, the cheque was very warmly received. The two hundred year old Southern Maltings has recently been refurbished and is now the creative centre of the town. The money will be used to continue the ongoing development and refurbishment of the building. The 40 Ware Joggers who arrived for the recent Stevenage Half Marathon were the largest entry from any club participating in the event. The course runs along cycle paths and through the picturesque Fairlands Valley Park, up across the ridge of the park and down along Six Hills Way, taking in many of the underpasses around the town and creating a challenging undulating two lap route. The course however appeared to provide very little challenge to Michael Waddington who continued his rise through the Ware Joggers' club championship by coming first in a time of 1:13:17 over four minutes in front of the second runner. 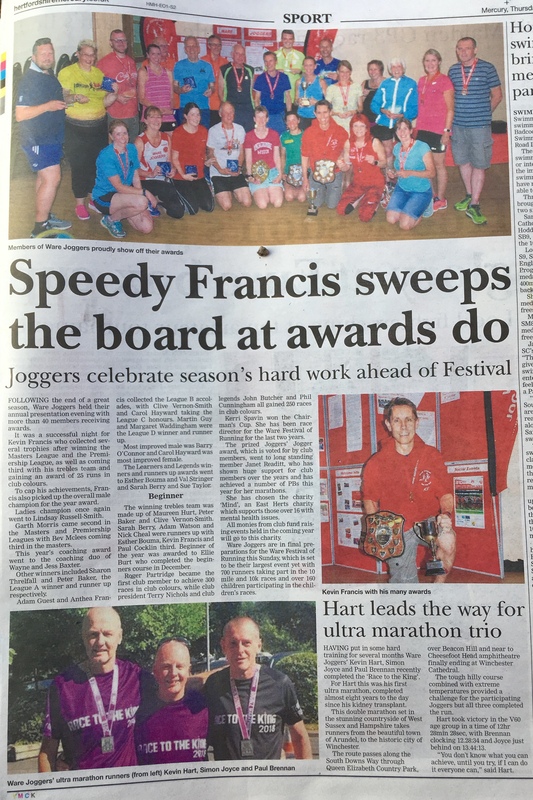 In achieving thius time he broke a Ware Joggers' Half Marathon club record for a senior runner which has stood for 29yrs. Those marshaling the course commented that Michael looked as though he was out for a casual Sunday morning run on his own as he passed them by on his solitary stroll to victory. Michael also achieved the Herts County award for winning the race, the senior age category award and a mens team award and Herts County Men's Team award. Ware Joggers' men Michael Waddington, Mark Cyl, 1:27:46, Neil Bull 1:26:25 and Jon Williams 1:21:29 took home the men's team award and the Herts County Men's Team Award. Anne Ramsden was the W60 winner 1:57:06 and Margaret Waddingham the W70 winner 2:15:27. On one of the wettest Autumn mornings so far, over 50 Ware Joggers arrived at Lee Valley Sports and Leisure Centre to compete in the Run the River 10K as part of their current championship league. The race, which took runners out via Pickett’s Lock along the river at Edmonton and through part of Lee Valley Regional Park, provided ample opportunity for many Ware Joggers to perform at their best. Michael Waddington won the race setting a new course record in a time of 33:35. The front bike marshal commented that he struggled to stay ahead of him because he was so fast! Beverley McLees came in as third lady in a time of 45:42. Other successes included Paul Reddaway who was first VM50 in a time of 39:03. Lisa Roberts who was first VW45 in a time of 47:19, Emily Reid who was third VW35 - 51:26, Michelle Cross who was second VW45 - 52:07, Teresa Weedon who was second WV55 - 53:03, and Neil Bull who was third VM40 – 39:34. Over 40 Ware Joggers are currently training to take part in the Valencia marathon which takes place in early December as well as preparing alongside other club members for their cross country season which also begins in December. While a number of Ware Joggers explore the western parts of Morocco on the annual club trek, many of those remaining in the cooler and wetter climes of the UK joined over 300 other runners to take part in the Harlow 10m race organised by Harlow Running Club. The multi terrain gently undulating course followed quiet country lanes and cycle tracks near Church Langley, past Latton Common and through part of Harlow Park before bringing runners into the finish on the running track at Mark Hall Sports Centre. Once again a number of Joggers were among the winners with Michael Waddington taking second place in a time of 56:35. Michael Waddington, Kevin Francis, and Mark Ford were the first men’s team home and Anne Ramsden scooped the VW65 ladies trophy with a time of 1:30:56. Ware Joggers Sharon Thelfall, Beverley Mclees and Paula Gollop were the second ladies team past the finish line. Ware Joggers started their new championship season with a bang this weekend when over 30 members joined approximately 500 other runners to participate in the Hyde Park 10k Summer Series. The fast, flat route took runners on a two-lap course through Hyde Park starting at the historic bandstand and running alongside the Serpentine and the parade ground before passing the Holocaust Memorial, Little Nell statue and Serpentine Lodge. With temperatures significantly lower than recent weeks, the race provided an opportunity for numerous PBs and excellent performances from many members of the club. Michael Waddington came first in a time of 34:21 with Oscar Bell coming in fourth in a time of 36:43 There was also age category success for Paul Reddaway who was first MV50 with a time of 39:00 and Margaret Waddingham who won the FV70 category in a time of 1:02:29. As many Ware Joggers begin to train for Autumn marathons, their 2018-2019 championship will continue with the Hatfield 5km series and Harlow 10m in the next few weeks. Runners brave the heat at this year's Ware Festival of Running. 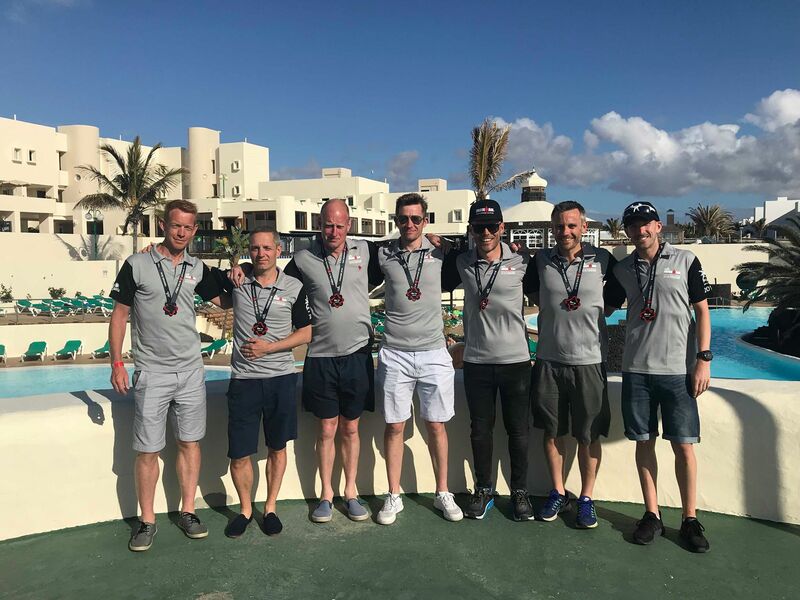 Following 12 months of the most gruelling training in sub-zero temperatures and torrential rain, often for up to eight hours at a time the ‘Magnificent Seven’ stood on the start line of the world’s toughest ‘Ironman’ course in Lanzarote’s beautiful Puerto Del Carmen. With a 4am start on race day to allow time to prepare equipment, the race began at 7am from the Playa Grande in Puerto del Carmen, the main tourist spot on the island. Having swum like fighting fish, across the 2.4 mile two-lap swim course, they swiftly transitioned to the 112-mile bike course, which is well known for its challenging 20mph headwinds and amazing views. With the 36-degree temperatures, desert-like conditions and an ascent of over 2,551 metres it is easy to see why this course is known as the toughest in the world. The full marathon distance running section took competitors along the thankfully flat sea front of Puerto del Carmen before leading up to Arrecife and back and then to Matagorda and back. This aspect of the race has the impressive support of thousands of spectators lining the streets as competitors pass beautiful views of the ocean under the intense Lanzarote sun. Many of the Ware Joggers who participated said that the experience was both absolutely gruelling as well as highly challenging and emotional. All have commented on the comradeship and support from one another throughout their training and the absolute delight of being at the start line together. All the Ware Joggers Ironmen expressed massive thanks and love to their families for their immeasurable support and commitment throughout the days and weeks of training and during the event. Lanzarote's Ironman, was brought to the island from Hawaii by Danish legend Kenneth Gasque in 1992 (pictured with the Ware Jogger Ironmen). The race continues to be one of the most fabled events in the Ironman calendar and Kenneth Gasque has shaken the hand of every finisher since the introduction of the race. Ware Joggers Magnificent Seven Ironmen results are as follows - Mark Cyl 14:39:05, Andrew Tait 12:00:19, Martin Blacker 16:36:03, Jack Whitelegg 13:35:06, Keith Williams 12:38:18, Mike Holliday 13:42:16, Howard Roden 12:39:47. An amazing achievement. 37 Ware Joggers joined almost 300 other runners for the High Easter 10k Race this weekend. The sunny blue skies and beautiful scenery around the village of High Easter provided a perfect setting for the penultimate race of the Joggers’ championship season. The fast and predominantly flat course, took runners out in in a loop around the outskirts of the pretty rural village through Stagden Cross and Bishop’s Green. The final part of the race brought runners back into the village past the Grade One listed 11th century church of St Mary The Virgin, which the proceeds from the race are used to help maintain. Despite the heat, Ware Joggers pulled it out of the bag once again, with several members bringing home the silverware! Harriet Kealy, for whom this was her first 10k, was third female in a time of 43:07, Garth Morris won the VM50 category in a time of 39:04 and Carol Hayward won the VW55 category in a time of 55:27. Garth Morris, Neil Bull, and Oscar Bell were the first men’s team home, and Harriet Kealy, Sharon Threlfall and Carol Hayward were the second women’s team home. Teams from Ware Joggers were out at parkruns this weekend, promoting the Ware Festival of Running which takes place on 8th July. This year is the 10th anniversary of the Festival and places for both the 10k and 10 mile events are selling fast. All finishers will be awarded a fantastic commemorative medal and hi tech t shirt. For more information visit www.ware10s.co.uk. As the Spring marathon season neared its close, 23 Ware Joggers took on the challenge of participating in one of the most famous running events in the world. With temperatures rising steadily from 9am to make this the hottest London Marathon on record, Joggers took their places at the start lines in Blackheath. Although the organisers had warned against the dangers of wearing fancy dress due to the heat, Ware Joggers found themselves surrounded by the usual collection of rhinos, fairies and superheroes. Once over the start line, with the inevitable adrenaline finally unleashed, Joggers followed the route with over 40,000 other runners through Greenwich to Tower Bridge and on to The Isle of Dogs where they were cheered on by over 50 of their fellow Ware Joggers who were marshalling this part of the route. As temperatures soared above 24 degrees, many runners struggled but all Ware Joggers managed to finish the course with decent times. Michael Waddington achieved a superb time of 2:50:15; Kevin Francis 2:58:26; Nick Kenyon-Muir 3:05:19; Charlotte Dadd 3:42:27; Jo Gladding 4:03:41 and, despite stopping for several hugs, Garth Morris broke the club record in the VM55 category with a time of 3:17:15. So far this season, over 60 Joggers have completed marathons in Barcelona, Manchester, Paris, Blackpool, Cambridge, Brighton and of course London and would like to express their thanks to Jan Stock who composes bespoke training plans and provides insightful advice on nutrition and technique to help club members prepare for their events. Jan herself, recently completed the 100K Ultra Tour of Arran. A group of 8 Ware Joggers flew the club colours at the Paris marathon. Having completed most of their training in sub zero temperatures throughout the winter months arriving in Paris to find a spring heatwave was a bit of a shock! The day of the race dawned bright and sunny and as Joggers gathered at the start near the Arc de Triomphe it was clear that the heatwave was not going to disappear. The event has almost 50,000 participants who followed the route through one of the most beautiful cities in the world. Beginning in the city centre and going out through the Bois de Vincennes, passing many famous landmarks including the Eiffel Tower, Place de Concorde, The Louvre and Notre Dame before going through the Bois de Boulogne and finishing amid the cheering crowds on Avenue Foch. For Ware Joggers Gemma Charville, (4:44) Neil Merritt (3:57) and Carol Hayward (4:51) this was their first marathon and despite the high temperatures all three finished in under their predicted times. Adam Guest (4:06) and Emily Kenworthy (5:12) both achieved PBs. Ware Joggers Anthea and Kevin Frances, Liz Coates, Paul Martin, Janet Readitt, Barry O'Connor, Clare Halfpenny, Caroline Stephens and Leanne Dring all completed the Manchester Marathon on the same day with, with Liz Coates, Janet Readitt and Anthea Francis all achieving GFA times. The Spring marathon season continues for Ware Joggers with the many participating in the London marathon this weekend, and many others working as marshals at the event. The fast flat course, which started at the famous Lee Valley White Water Centre, provided the opportunity for a number of Ware Joggers to win prizes in the recent Lee Valley RunFest. With a day that presented perfect temperatures for running, the 10k and half marathon races took runners through a winding route in the beautiful setting of the River Lee Country Park. The 10k race which was part of this year’s club championship afforded all 43 participating Ware Joggers a chance to perform at their best. Oscar Bell scooped first prize with a time of 35:27, 2nd prize went to Kevin Francis 35:40 and 1st lady was Lindsay Russell-Smith who finished in 41:01. Kevin Francis also gained 1st in his age category M40, with his wife Anthea Francis gaining 1st place in her W40 age category. Garth Morris came 2nd in the M50 and Carol Hayward 2nd in the W50. Anne Ramsden took first prize in the W60, Terry Nichols in the M70, Margaret Waddingham 1st in the W70 with Vibeke Rowe 2nd in the same category. As the season begins to draw to an end the competition for first and second places in the respective championship leagues is becoming fierce and final results could hinge on the last few races which take place in May. A total of 17 Ware Joggers were able to escape the chilly winter weather as they headed off to the sunnier climes of Barcelona for the marathon last weekend. The day of the race produced beautiful spring-like conditions with just a few clouds in the sky. The slightly undulating circular route took in some of the amazing sites of the city including the Casa Mila, Casa Batlo camp Nou, Sagrada Famila and the Olympic Village. The support of the crowds was fantastic with their shouts of ‘Venga Venga’ willing runners towards the finish at the Placa De Espana with the beautiful Montjuic Fountain in the background. A number of Ware Joggers achieved personal bests including Michelle Cross, Barry O’Connor, Lisa Roberts, Lorraine Oakley and Jo Gladding, who finished in a time of 3:53:38 knocking 28 mins off her previous marathon time. Also pictured centre front is Paul Brennan who ran the Chester Ultra in a time of 12 hrs and 58mins. The 52 mile ultra, fused together some of the best trails in the area including Delamere Forest, The River Dee and Sandstone Trail. Numerous Ware Joggers are currently completing their training for both the Paris and London marathons which take place in the next few weeks. Twenty five Ware Joggers took on the challenging Baldock Beast Half Marathon. The course which begins on the outskirts of the town of Baldock took runners out into the hilly terrain of the Hertfordshire countryside. Battling against chilling winds and sub zero temperatures Ware Joggers joined 400 other runners and followed the route up through the villages of Wallington, Sandon and Roe Green before hearing back into Baldock, thankful for some descending gradients in the last few miles. 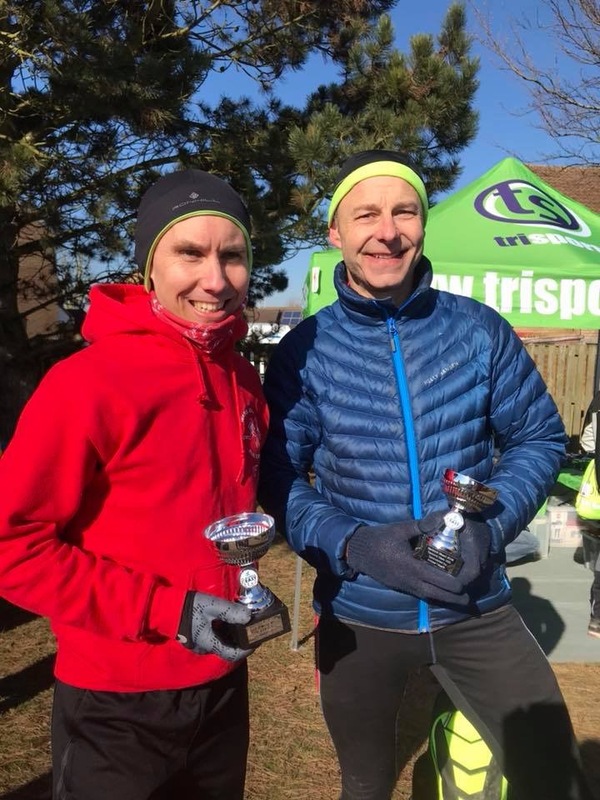 All Ware Joggers managed to ‘tame the beast’ with Kevin Francis taking fifth place overall in the race and coming first in the Men’s V40 age group while Garth Morris came third in the V50 age group. A team of Ware Joggers are currently in the process of organising their own running event in the form of the Ware Festival of Running which is celebrating its 10th year in July. When a group of (male) Joggers have a post run shower there is inevitably some humming (and hawing) which in turn leads to singing, yes really. And so it was that the Ware Joggers Choir was formed 5 years ago. Requests (pleas) for singers generated a motley band some of whom (not all, you understand) can actually sing. The rest, as they say, is history. The choir meets weekly at Anne Ramsden's house on Monday evenings and is bravely and very skilfully led by multi instrumentalists Bill Gristwood and his wife Julia. We also have several singers who play instruments. We sing because we all enjoy it and because there is always cake - usually made by Anne. We have performed in public a few times - mainly for the residents at Willowthorpe Residential Home, but also at club events. For the last couple of years we have sung carols around the area raising money for local charities.